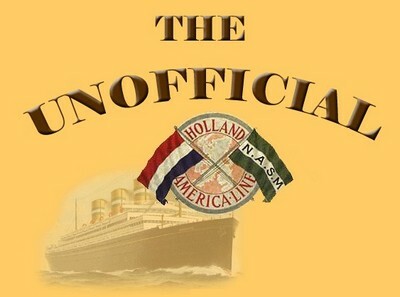 The "Unofficial Holland America Line" site is dedicated to the love of Ocean Liners and notably, the 135 year history of the Holland America Line. 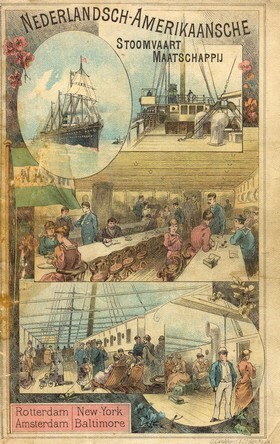 The historic data from the inception of the Line in 1872 until the present is richly illustrated with articles,photos and postcards of ships, past and present from different sources accross the world with credit to the different sources if known. A great many sources have contributed to this site and though there are too many to mention, one should be highlighted. The original author of this site is Hans Segboer, a valued colleague and fellow collector of the history of the Holland America Line. Without his years of dedication to originate and maintain this site, it would not exist. As a community of Holland America Line historians and collectors We acknowledge him with deep gratitude. After a few years of not having a lot of time to update the "unofficial", I am getting back into working on it. Many things have happened and my collections of luggage labels and stickers is now approaching completion. I have not seen any luggage label I do not have in at least 8 months, so I am beginning to think it is time to publish. In the short term I will be issuing a magazine format publication that any interested party can get at cost with the history of the luggage labels as well as the complete collection in pictures with value estimates based on current market. Anyone interested can contact me at tiemen @ halpostcards . com (remove spaces before you email). If this is received well, I will publish more of the same over time with subjects such as "ceramic plates", "silver teaspoons". etc.